Pressure relieving cushions can reduce pressure on the hipbone and provide the user adequate support for proper posture. 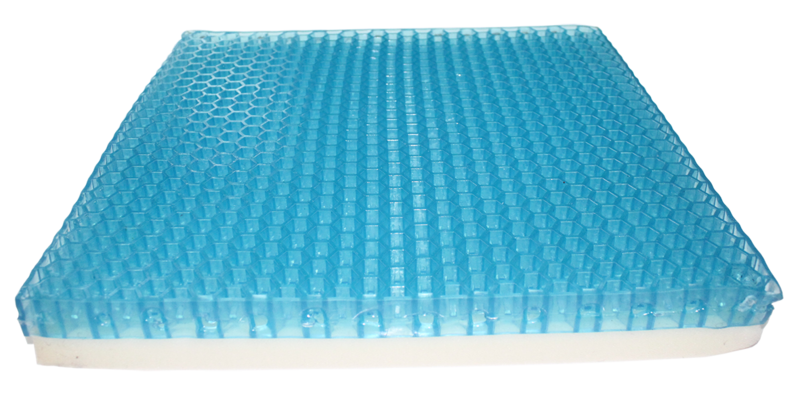 If used for a long time, the cushion must also be able to prevent bedsores (pressure ulcers) effectively. There is a large variety of pressure relieving cushions in the market, but do pay attention to the design, the materials used, the support and antibacterial and cooling capacity, etc. when looking for the right cushion. Cutout at the rear of a cushion is designed for tailbone pressure reduction, while the wedge design can help to maintain proper curve of the spine and reduce waist pain. It can promote good posture while keeping the natural curve of the spine. In addition, such design can ensure that the pelvis is higher than the knee when sitting, so as to relieve lower back fatigue. These designs that promote good posture can reduce tension of the extensor muscles of your waist and reduce pressure on your lower spine for prevention and improvement of lumbar disc symptoms. The most common materials used to make cushions in the market are sponge, gel, dry polymer, etc. The durability, safety, supporting force and compressive effect should be considered when selecting cushion materials. High-quality sponge usually provides users with excellent support and comfort, but if used on a long-term basis, sponge absorbs heat and moisture which may cause pressure ulcers to be formed easily. Gel and dry polymers are effective in evenly distributing and reducing the pressure arising from sitting and sleeping, and also in dispersing the heat generated from direct contact with the body. This can effectively increase the comfort level and prevent pressure ulcers. As far as safety is concerned, gel may leak out after prolonged use, but not in the case of dry polymer or sponge cushions. Each material has its strengths; it is important to consider the user's desired effect when selecting the cushion. For maximum reduction of pressure and sheared force, cushions must be able to support the hips and distribute your body weight evenly. Being able to cradle the back and keep both sides of your upper thighs in a natural contour shape helps eliminate pressure on your bones. Cushions should have the elasticity good enough to reduce the pressure of sitting and lying down. If the cushion material is compatible with human body, there will be minimum resistance when moved and will then prevent shearing force. Cushion is our partner during prolonged sitting, so it is necessary to have antibacterial, mildew resistant and deodorization features. It is ideal that cushion materials are waterproof, urine resistant, and easy to clean and dry as well.